Unit 42 has discovered activity involving threat actors responsible for the OilRig campaign with a potential link to a threat group known as GreenBug. Symantec first reported on this group back in January 2017, detailing their operations and using a custom information stealing Trojan called ISMDoor. In July 2017, we observed an attack on a Middle Eastern technology organization that was also targeted by the OilRig campaign in August 2016. Initial inspection of this attack suggested this was again the OilRig campaign using their existing toolset, but further examination revealed not only new variants of the delivery document we named Clayslide, but also a different payload embedded inside it. In the past, we had primarily associated the OilRig campaign with using the Clayslide documents to deliver as a payload a Trojan we named Helminth; in this instance, the payload was instead a variant of the ISMDoor Trojan with significant modifications which we are now tracking as ISMAgent. On July 16, 2017, actors associated with the OilRig campaign sent emails to five different individuals within the targeted organization. All of the emails sent had the same subject, attachment filename, and attached Excel file (SHA256: 3eb14b6705179590f0476d3d3cbd71665e7c1935ecac3df7b876edc9bd7641b6). The macro within the delivery document will unhide and display a new worksheet that contains a fake invoice for Citrix products, as seen in Figure 2. This fake invoice acts as a decoy document to minimize the user’s suspicions that any malicious activity occurred. Paltofp1 = Paltofp1 + "AAAAAAEAAA4fug4AtAnNIbgBTM0hVGhpcyBwcm9ncmFtIGNhbm5vdCBiZSBydW4gaW4gRE9TIG1v"
Paltofp1 = Paltofp1 + "ZGUuDQ0KJAAAAAAAAAAtSGbjaSkIsGkpCLBpKQiw3bX5sGUpCLDdtfuw5ykIsN21+rBwKQiw94nP"
Paltofp1 = Paltofp1 + "sGgpCLCMcAuxeikIsIxwDbFLKQiwjHAMsXgpCLBgUZuweCkIsGkpCbAHKQiwm3ABsWgpCLCbcPew"
Paltofp1 = Paltofp1 + "aCkIsJtwCrFoKQiwUmljaGkpCLAAAAAAAAAAAFBFAABMAQUAEphZWQAAAAAAAAAA4AACAQsBDgAA"
The macro then writes the concatenated base64 encoded data to the file %PUBLIC%\Libraries\B642.txt. It then reads in the “B642.txt” file and decodes the data, which it will save to the file %PUBLIC%\Libraries\servicereset.exe (SHA256: 52366b9ab2eb1d77ca6719a40f4779eb302dca97a832bd447abf10512dc51ed9). The servicereset.exe file is the payload of this attack, which is a variant of ISMDoor that we track as ISMAgent. The script then creates a file named %PUBLIC%\Libraries\OfficeServicesStatus.vbs which contains a VBScript that will execute the “servicereset.exe” file using the command line. Lastly, as a persistence mechanism, a scheduled task named “OfficeServicesStatus” will be created, set to run every three minutes, as seen in Figure 3. While hunting for other samples similar to the one observed in the attack against the technology organization, we discovered yet another variant of Clayslide (SHA256: 5ac939a5426db8614165bd8b6a02d3e8d9f167379c6ed28025bf3b37f1aea902). This sample was dated June 2017, a month older than the newest version containing ISMAgent. Based upon timestamping and similarities with both the original Clayslide documents as well as the newest ISMAgent loaded ones, we believe this June 2016 sample to be an iterative version of Clayslide. 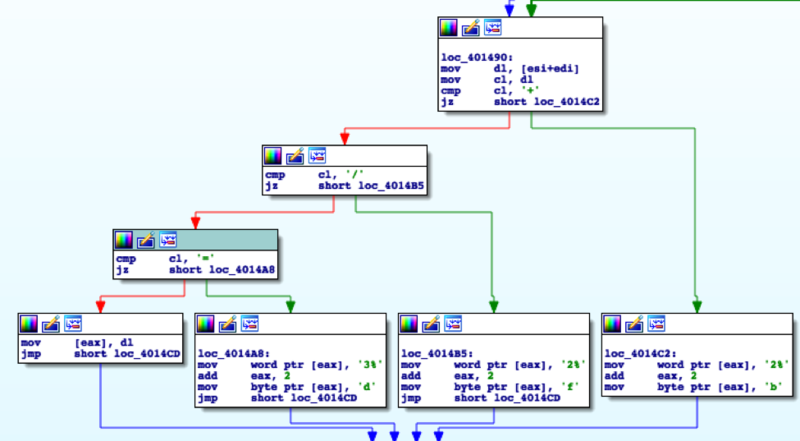 The June 2017 sample of Clayslide contained the same OfficeServicesStatus.vbs file found in the ISMAgent Clayslide document, but instead of having the payload embedded in the macro as segregated base64 strings that would be concatenated, this variant obtained its payload from multiple cells within the “Incompatible” worksheet. 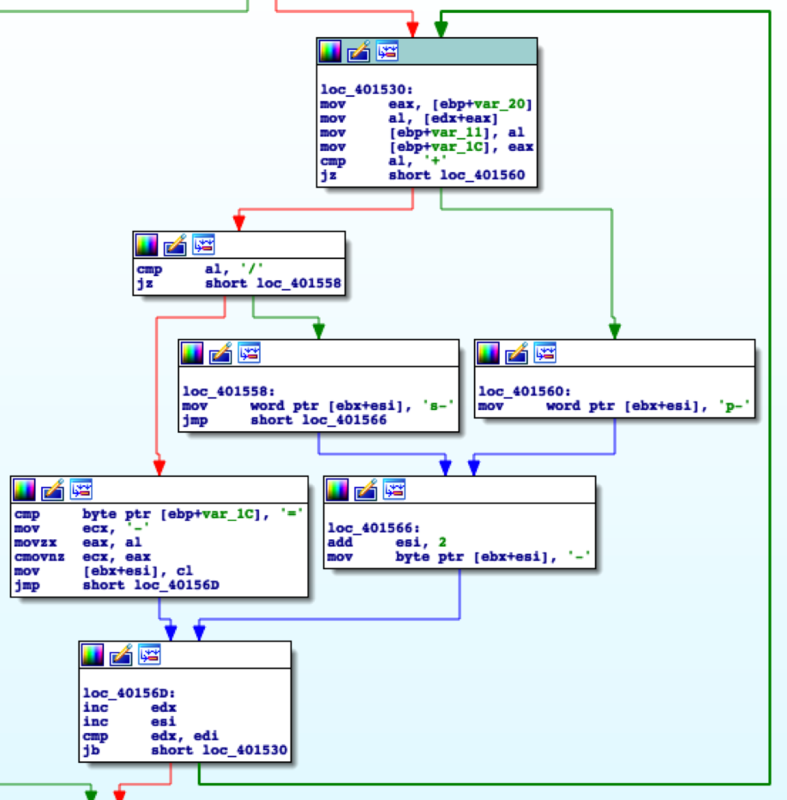 This technique was observed in previous Clayslide documents to access the script variant of the Helminth Trojan in earlier OilRig attacks. Although structurally the document was more similar to the originally discovered Clayslide documents, this June 2017 sample was designed to load ISMAgent instead of Helminth. 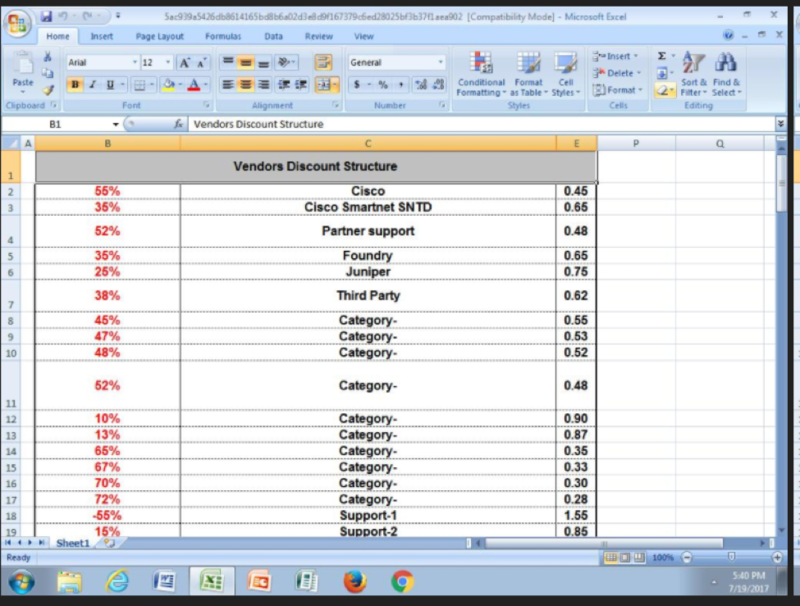 We do not have targeting details for this sample, although the decoy document contained a similar theme to the newest Clayslide document, displaying vendor related information (Figure 4). The payload (SHA256: 52366b9ab2eb1d77ca6719a40f4779eb302dca97a832bd447abf10512dc51ed9) delivered in the June 2016 attack is a variant of the recent ISMDoor versions that use DNS tunneling for its C2 communications. 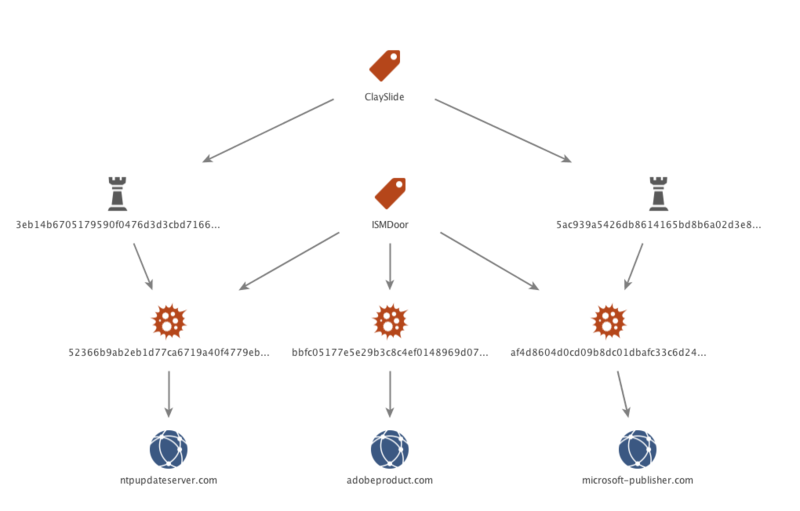 On May 1, 2017, Arbor Networks published research on ISMDoor using DNS tunneling to communicate with its C2 server, which is nearly identical to the DNS tunneling the payload of this attack carries out. Due to considerable differences and evidence of potentially different authors between the previous ISMDoor samples and this newly discovered variant, we are tracking this new variant as ISMAgent. cmd /c schtasks /query /tn TimeUpdate &gt; NUL 2&gt;&amp;1 || schtasks /create /sc minute /mo %%%% /tn TimeUpdate /tr \"\\\"
The Trojan is able to use two mechanisms to communicate with its C2 server: HTTP requests and DNS tunneling. The DNS tunneling protocol found in this payload is remarkably similar to recent ISMDoor samples, as documented in Arbor Networks’ research. Similar message handling is found in both ISMAgent and ISMDoor, in addition to the existence of strings in both samples, such the hardcoded IPv6 values. The similarities may allow for backward compatibility between ISMAgent and ISMDoor C2 infrastructure. In the payloads themselves, a number of differences exist, enough that in essence they appear to be different tools. ISMAgent prioritizes HTTP as its mechanism to communicate with the C2 server, but if it is unable to reach the C2 server it will switch to the DNS tunneling mechanism. To carry out its HTTP C2 communications, the Trojan prepends “www.” to the configured C2 domain and issues a DNS query to resolve this domain. The Trojan will use the resolved IP address as the host in the HTTP beacon request. ISMAgent uses its DNS tunneling technique for C2 as a backup to its HTTP capability. This mechanism supports the same command message structure and even handles the commands in the same manner. The Trojan sends data to the C2 server via DNS queries by encoding data and using the encoded string as a subdomain of an actor owned domain. The C2 server can send data to the Trojan by resolving the DNS queries to IPv6 addresses that the Trojan treats as hexadecimal data. The DNS server will then respond to these DNS queries with additional IPv6 addresses that the Trojan will treat as hexadecimal data as described by Arbor Networks. The ISMAgent payload embedded inside the newest variant of Clayslide used the C2 domain ntpupdateserver[.]com. The primary second-level domain has no IP resolution, instead relying on www.ntpupdateserver[. ]com for resolution then two specific subdomains of ns1.ntupdateserver[. ]com and ns2.ntpupdateserver[. ]com as the actual DNS C2 handler. The ISMAgent payload embedded inside the June version used a completely different C2 domain at Microsoft-publisher[. ]com, but used the exact same domain name structure. Lastly, we were able to identify a third sample of ISMAgent leveraging another unique C2 domain, adobeproduct[.]com. Pivoting on the WHOIS phone number we found two additional domains. These are registered with the same Registrar, have the same WHOIS address, but the registrant name “bolips Angelio” and email address bolips[at]outlook.com. Thematically, these domains follow the pattern of ISMAgent and OilRig C2 domain names, abusing typo-squatting techniques in attempts to appear as legitimate domains. Each of these additional domains had the same structure as the three ISMAgent C2 domains, with no IP resolution on the primary second-level domain containing the www, ns1, and ns2 subdomains. Based off the same registrant email address and domain name structure, it is highly probable these other domains are also part of the ISMAgent infrastructure as C2 servers. Lastly, we identified another ISMAgent sample using the C2 domain of adobeproduct[. ]com, which again fits thematically and was also found to have the www, ns1, and ns2 subdomains attached to it. On the surface, the ISMAgent payload appears similar to the ISMDoor payload, sharing functionality such as a specific DNS tunneling protocol. However, closer analysis shows there are enough differences between the two payloads that justifies tracking ISMAgent as its own tool with its own name. First, all known ISMDoor payloads using DNS tunneling were created for 64-bit architectures, while all known ISMAgent are x86 only. The most recent ISMDoor payloads using DNS tunneling have abandoned HTTP as a C2 communications method compared to earlier ISMDoor samples, whereas ISMAgent uses HTTP as the primary method and DNS tunneling as a secondary method to communicate with its C2 server. During our data collection process, we discovered a Clayslide delivery document (SHA256: ca8cec08b4c74cf68c71a39176bfc8ee1ae4372f98f75c892706b2648b1e7530) from September 2016 containing a payload that appeared to be the Helminth script variant as found in other Clayslide documents, but upon further examination was wholly different. The macro within this Clayslide documents obtains a PowerShell script from a cell in the “Incompatible” worksheet, much like previous samples. The macro then saves a VBScript to %PUBLIC%\Libraries\LicenseCheck.vbs to run this PowerShell script every 3 minutes. Like the Helminth script variants, this PowerShell script is a malicious payload that uses both HTTP requests and DNS tunneling to interact with its C2 server. However, the HTTP requests and the protocol employed to perform DNS tunneling differs dramatically from Helminth scripts installed by all other known Clayslide samples. The HTTP requests and DNS tunneling protocol found in this PowerShell script are instead identical to ISMAgent. The C2 domain used for this script was mslicensecheck[. ]com, which had previously been reported by LogRhythm in their OilRig whitepaper. Interestingly, it was the only domain associated with OilRig that did not have an IP resolution at its second-level, much like the ISMAgent samples. The “doIt” function within the PowerShell script, seen in Figure 7, is responsible for initiating the C2 communications, as well as parsing the data provided by the C2 server to run the appropriate commands. This function uses the strings “/action2/”, “/response/” and “/upload/” within the C2 URLs when using HTTP to communicate with the C2 server. This behavior and these strings were also observed in the ISMAgent C2 behavior. The “doIt” function also shows that the C2 server will respond with data structured the same way as ISMAgent, using “#” as a delimiter and various offsets such as offset 0 used in subsequent requests with the C2, offset 2 specifying a URL to download a file from, offset 3 specifying a command to execute using command-prompt, and offset 4 specifying a path to a file to upload to the C2 server. Also, as seen in the code above, the PowerShell script makes sure the base64 encoded data used is safe to use in an HTTP URL, by replacing the characters “=”, “/” and “+” characters with hexadecimal equivalent. The ISMAgent payloads also performed the exact same replacement, as seen in the portion of code in Figure 8. This functionality is again replicated within the ISMAgent payload for its DNS tunneling functionality, as shown in Figure 9. 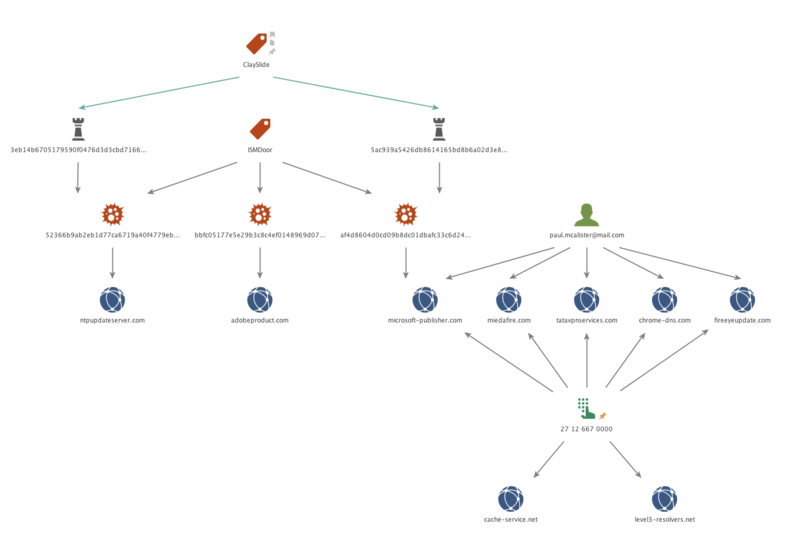 The OilRig campaign has repeatedly demonstrated a willingness and desire to be iterative in their toolset, while maintaining some level of similarities over time. In this scenario, we were able to directly observe this type of behavior, while also implement a tool thought to be previously unrelated to OilRig. With the inclusion of ISMAgent within the OilRig toolset, we are beginning to see stronger relationships between the various documented groups operating in the Middle East. This region has proven to be a hot bed of espionage motivated activity over the last couple of years, and there appear to be no signs of this changing. As our research continues, our goal will be to generate even better understandings of the true extent of the various operations in this region and the relationships between them.